“Today, Gov. Rauner had the opportunity to fix the worst school funding formula in the nation. He had a chance to sign legislation that brings equality to a system that currently shortchanges the school districts that need our help the most. Updated at 3:15 p.m. with reaction to Senate's override of governor's budget veto. “Two weeks ago, Gov. Bruce Rauner called the General Assembly into emergency special session to pass a responsible, balanced budget. Today, the General Assembly passed a responsible, balanced budget with support from Democratic and Republican lawmakers — and Gov. Rauner immediately vetoed it. “His actions are unbelievable, hypocritical and irresponsible. “This afternoon, the Senate overrode Gov. Rauner’s reckless veto of our responsible, balanced budget with bipartisan support. We put our duty to protect Illinois and its residents above petty, partisan politics. “Today’s bipartisan vote to send a responsible, balanced budget to Gov. Rauner was necessary. Just as every responsible business owner and head-of-household must do, Republican and Democratic lawmakers sat down with the books to find a way to make both sides of the ledger balance. “Through a combination of deep spending cuts and modest revenue increases, we adopted a responsible, balanced budget that will halt the chaotic downward spiral from which it could take decades for Illinois to recover. “We cut the state’s operational spending by about $5 billion. “We cut state agency funding 5 percent across the board. “We cut spending on pensions by $1.5 billion this year. “We appropriated $380 million less than the governor’s proposed budget, and we devoted the budget surplus to paying unpaid bills. “We closed corporate tax loopholes, recapturing almost $125 million in new tax revenue. “We restored the income tax rate to 4.95 percent – the rate agreed to by Gov. Rauner and less than the rate in effect just three years ago. “Two years of autopilot spending without a budget, coupled with various court-ordered payments, led to this inevitable vote: Illinois for the first time in history is no longer taking in enough revenue meet its monthly expenses. This isn’t a political accusation. It’s a mathematical reality. “With this budget package, we’ll begin to address the state’s unpaid bill backlog, stabilize state universities, offer MAP grants to college students, ensure public schools open in the fall, fund human services, eliminate government programs that we can live without and stave off an embarrassing junk bond status for the state. It spends less than what the governor originally requested. It’s the right package for right now." The Senate today voted to send Gov. Rauner a budget package that could put an end to the two-year stalemate that has crippled Illinois’ finances and has bond rating agencies threatening to lower Illinois to an unprecedented “junk” credit rating this week. The House approved the same package of legislation on Saturday with support from both Republicans and Democrats. Gov. Rauner threatened to veto the package if it landed on his desk and by 2 p.m. had followed through on his threat. The Senate then voted to override the governor’s veto and sent the package to the House for an override vote. Wall Street was waiting to see what happens. Junk bond status means it would cost more for state and local governments to borrow money to pay for services and institutional investors would be forced to sell Illinois bonds at deep losses. It’s a $36.1 billion balanced budget. It authorizes less spending than Gov. Rauner introduced in his $37.3 billion plan in February. It incorporates key ideas from plans put forth by both Democrats and Republicans. Personal income tax rate will go to 4.95 percent from 3.75 percent. Generates $4.453 billion annually. This is a 1.2 percentage point increase, or a 32-percent increase in the tax rate. Corporate income tax rate will go to 7 percent from 5.25 percent. Generates $514 million annually. Both changes are permanent and both are retroactive to July 1, 2017. There are no service taxes, no soda taxes, and no satellite or streaming taxes in this proposal. 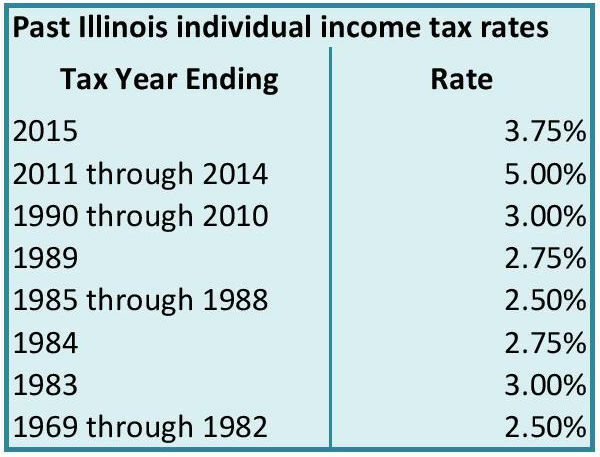 Illinois would continue to be one of few states that do not tax retirement income. Increases the Earned Income Tax Credit to 14 percent from 10 percent in 2017; increases to 18 percent in 2018. Increases the cap on the Education Expense Credit to $750 per family from $500. Creates a new tax credit of up to $250 for educators who use personal funds to purchase classroom supplies. Means tests the Education Expense Credit, the Personal Exemption and the Property Tax Credit; they would only be available for those making less than $250,000 per year (single filers) or $500,000 per year (joint filers). Creates the Uniform State Tax Lien Registration Act, a Republican initiative. Allows the Illinois Department of Revenue to file notice of tax liens in the registry, bypassing the need to file them with county recorders. Worth $40 million per year. SPRINGFIELD – About 36,000 senior citizens could be neglected or forced into nursing homes if the Rauner administration pushes forward with an untested in-home care program with no state budget in place. 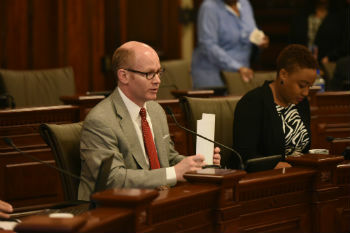 State Senator Don Harmon, an Oak Park Democrat and president pro tempore of the Illinois Senate, said putting senior citizens into crisis to save money is unacceptable and pledged to protect the state’s existing Community Care Program, a proven decades-old program that provides services for non-Medicaid seniors so they can live independently and thrive in communities throughout Illinois. “This is typical of the Rauner administration. In the rush to save millions of dollars in the short run, it would jeopardize billions in the long run,” Harmon said. “These are real senior citizens who depend on this program and would be deprived. Where we could spend a few hundred dollars a month providing services seniors to keep them in their homes living healthy, integrated lives, we now risk moving them into nursing homes at a cost of tens of thousands of dollars a year. The administration is moving forward with plans to establish the Community Reinvestment Program, which it says would save the state $120 million in the first year. But critics say the state will achieve those cost savings by replacing trained home care workers with services such as Uber drivers, laundry services and meal vouchers, greatly diminishing the quality of care that vulnerable senior citizens receive. 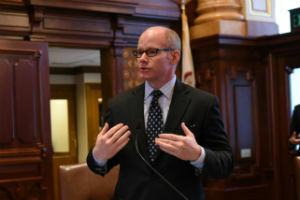 Furthermore, rather than establish the new program through legislation, which comes with opportunities for hearings and public feedback, the Rauner administration chose to bypass the General Assembly, instead adopting rules that must only be presented to the legislature’s Joint Committee on Administrative Rules, more commonly referred to as JCAR. A bipartisan supermajority vote by JCAR is required to slow or halt the adoption of the Rauner administration’s rules. Harmon is a co-chairman of JCAR. 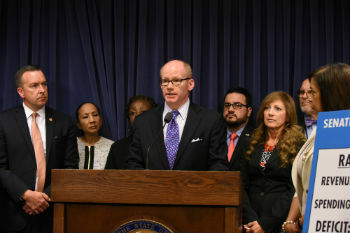 Harmon appeared at a news conference Wednesday with opponents to the plan, including Lori Hendren, associate state director for AARP Illinois; and Barbara Franklin with the Illinois Alliance for Retired Americans. State Senator Ira Silverstein (D-Chicago) also spoke at the news conference. Hendren said the governor’s pilot program is besieged with alarming safety loopholes, unprecedented policy control by the administration and unreliable care options for senior citizens and their loved ones. “AARP Illinois is calling upon all elected officials – Republicans and Democrats – to rise above politics and hear the cries of Illinois’ aging seniors who are fearful their current in-home and community care will be taken from them under Gov. Rauner’s alarming initiative,” she said.